The warm, dry winter California experienced is bumping the seasons forward a bit this year. Trees are already changing into their autumn finery, and while the light doesn’t say, “Summer’s over,” just yet, there’s definitely a sense that it’s about to wind to an end. Because it’s been so warm for so long, much of our summery wines had already been enjoyed, and our very last bottle of rosé sat lonely in the refrigerator. With the sense of change in the air, it felt like it was time to seize the opportunity to enjoy that lovely, pink wine while the evenings were still warm. But what to pair it with? Salad Niçoise is always a bright and savory choice for a summer’s meal, but wouldn’t it be even better sandwiched between two halves of a sourdough roll? With such a thought in mind, I created one heck of a sandwich. Wash potatoes. Put a small pot of water on to boil. Sprinkle in some salt and add the potatoes. Once the water begins to do a roiling boil, carefully put the eggs in. Put on a lid and turn off the fire. Let the potatoes and eggs sit for 20 minutes. Pour off the water and rinse with cold water until the eggs are only slightly warm to the touch. Peel the eggs and slice. Cut the potatoes in half and drizzle with olive oil as well as sprinkling them with salt, pepper, and parsley. Set aside. While the potatoes and eggs sit, warm a stove top griddle over low heat. Slice the rolls in half, butter each half and sprinkle with garlic powder. Place on the griddle until the open faces of the bread is golden brown. Remove from heat. Spread mustard on each piece of bread. 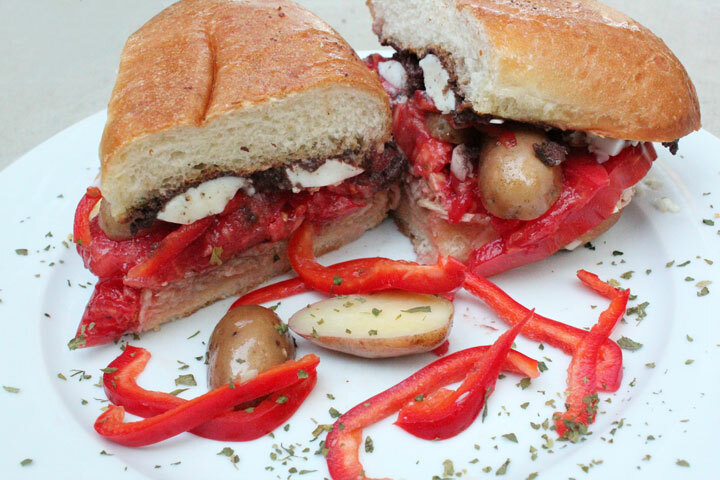 Spread tapenade on one slice of each roll and anchovy paste on the other slices. Sprinkle the onions on the tapenade side and press down lightly. Then assemble the sandwiches with the rest of the ingredients, layering carefully so everything doesn’t slide right out. I put the tuna on top of the anchovy paste, the red pepper next, then the tomato, egg slices, and finally, the potatoes. This is a huge sandwich, so feel free to share the other half with your other half and save the other sandwich for later. Serve with a side of green beans (a staple of Salad Niçoise), and enjoy this last breath of summer. My birthday is coming up, and it’s also the two year anniversary of Sapid Cellar Door, so I thought it would be fun to make one of my favorite childhood dishes to celebrate. My mom would make me the dinner I requested for my birthday, and I always asked for one of two things – porcupine meatballs, or even more often, tuna muffins. Man oh man, I loved those things! Even after moving out on my own, they were still my “special treat” meal. I’ve made these muffins a lot through the years, and as I created them last night, shaping the tops with a spoon, it was all still muscle memory. I didn’t really have to think about what I was doing. I just did it. I paired these muffins of memory with my absolute favorite food wine, Gazela Rose. It’s a refreshing, lightly fruity wine with a lovely, mineral finish and hint of effervescence. Whenever I’m not quite sure what to pair with a meal, I grab this wine, and it never disappoints. Plus, it’s wonderful on a warm summer’s evening, sitting on the deck, watching the wildlife begin to stir. We always try to have a case of it on hand. Mix all ingredients together. Pack into the muffin pans, rounding the tops with a spoon to resemble muffin tops. Bake for 20-25 minutes or until the outside of the muffins begins to brown. 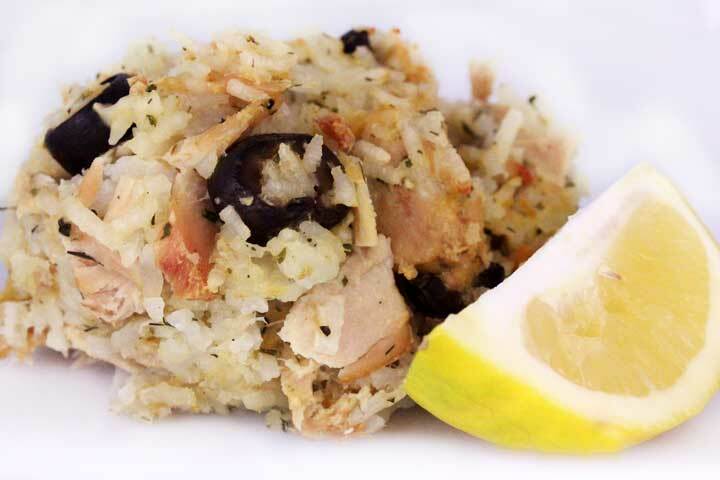 I like to eat my tuna muffins with a squeeze of fresh lemon juice. A little drizzle of melted butter is also very nice. I’m sure many people could claim the same, but I’m a sushi junkie. 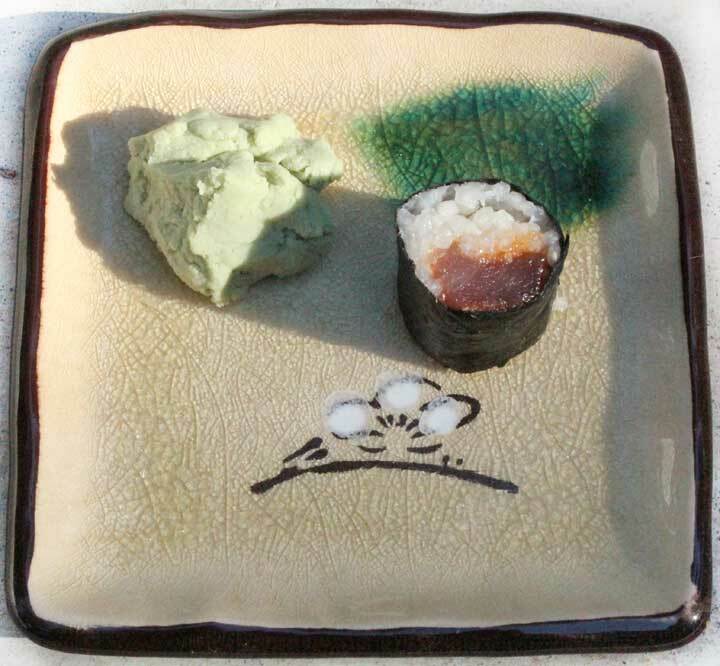 I love the stuff — how it tastes, the springy sensations of nori as you grab a roll, how good you feel after eating it — what an absolutely amazing food! I was given the gift of making-sushi-knowledge when I played host to a couple of friends of mine, Eryn and Ellen, while they waited on the availability of their new apartment. Eryn worked at a local sushi restaurant and taught me the ins and out of creating a fine roll. It was a great payment for letting them stay at my place. I definitely came out ahead! 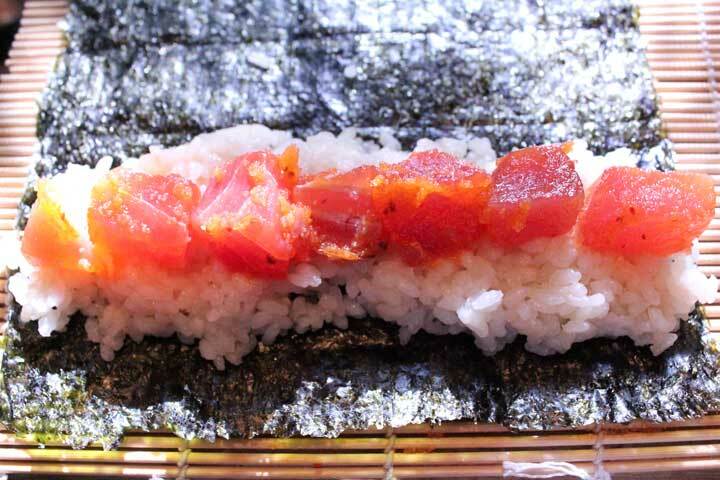 The other day, I was walking by the fish case at work and spied some lovely spicy tuna, glistening on its bed of ice and knew that sushi dinner was in my immediate future. I purchased 3/4 of a pound, which made a LOT of rolls for the evening’s fare. First, I cooked one cup of dried sushi rice. Once the water cooks off, the rice is sticky. That’s what you want. I then mixed in one Tablespoon of rice vinegar and one Tablespoon of sugar (I had dissolved the sugar into the vinegar ahead of time) to the rice using my fingers, making sure that the liquid was distributed thoroughly. After rinsing my hands, I laid out my bamboo mat (similar to this) and placed a piece of nori onto it. 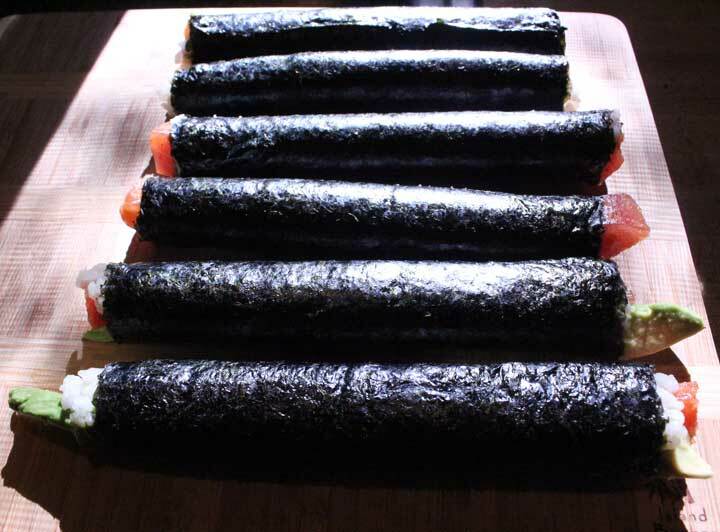 Then I spread — with my fingers — an even strip of rice across the bottom of the nori and placed the tuna on top of that. 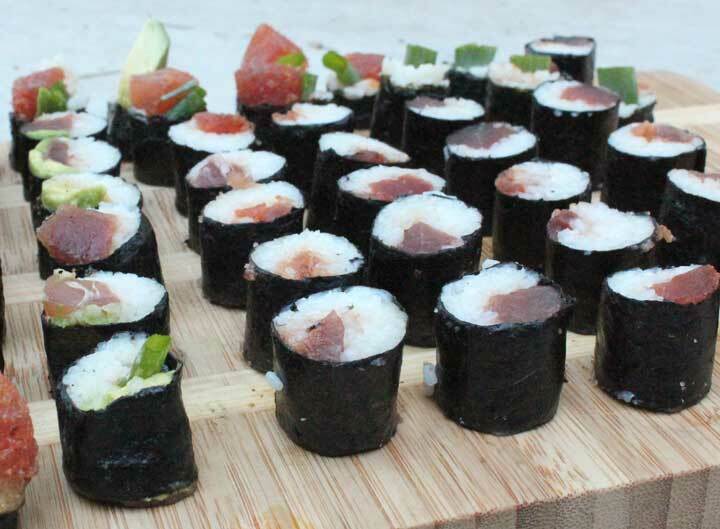 Since the amount of tuna ended up making quite a few rolls (six to be exact), I had some fun with it. I added some avocado to a couple of rolls, Larrupin Dill Sauce to one, green onions to some… the possibilities are endless. Be creative! It’s fun you get to eat, after all. Then it’s time to cut. Use a very sharp knife. I always do this next to the sink so that I can rinse my blade as often as needed. Since the rice is sticky, it will coat the blade quickly. Cut each piece the width of two fingers or so. If you like taller rolls, go for it. It’s your dinner, so do what makes you happy. Serve with wasabi, soy sauce, and pickled ginger and enjoy how your belly happily buzzes after the meal.